RT ARTICLE: The EU is on the brink of collapse, as two of its main “pillars” are “crumbling” despite the billions of euros spent on keeping the structure from falling, far-right French leader Marine Le Pen told RT, adding that the union would fail if France left it. As a “revealing” piece of evidence supporting her opinion, Le Pen cited one of Brussels’ recent punitive measures. “The threat of condemnation of countries which do not accept migrants – a €250,000 fine for each migrant not taken in – is in itself revealing,” Le Pen said. The European Commission unveiled plans earlier in May to impose a penalty of around €250,000 per rejected refugee on countries that refuse to share the burden of Europe’s migrant crisis. For countries such as Poland, which is adamantly opposed to taking in refugees, the new compulsory measure would result in a fine of over €1 billion ($1.1 billion), given its existing quota of 6,500 people. “The threats, the blackmail, now used systematically by the European Union is, above all, a gigantic problem of weakness,” Le Pen said. Commenting on the migrant crisis, Le Pen said the EU is using immigrants as a tool to drive down labor costs across the 28-country bloc. 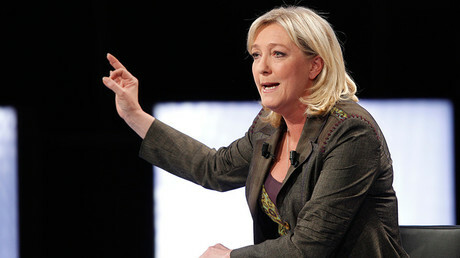 Marine Le Pen has been a vocal supporter of the UK leaving the European Union, a move that the National Front hopes would inspire a similar “Frexit” campaign. According to a March poll, 53 percent of French citizens surveyed would like to hold a Brexit-like referendum on France’s membership in the EU.